Indian eves packed a punch to achieve a record medal haul in the fourth edition of the World Women’s Boxing Championship in New Delhi recently. The gold rush even exceeded the expectations of the Indian Amateur Boxing Federation, which was hoping to get at the most two gold. TENNIS star Sania Mirza and badminton prodigy Saina Nehwal have more in common than their similar-sounding names. Both are young and fiercely competitive. They have it in them to take on the best in the world. Their fortunes during 2006, however, have been as different as chalk is from cheese. 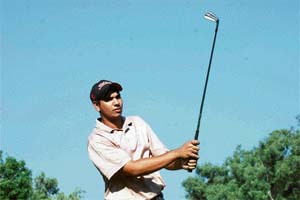 Eighteen-year-old Gaganjeet Bhullar of Kapurthala showed his class in the Royal Challenge Samarvir Sahi Amateur Golf Championship at the Chandigarh Golf Club last week. He bridged the four-stroke gap between him and India’s No. 1 amateur player, Anirban Lahiri, on the final day and then upset the Secunderabad player in the playoff. Pakistan’s batting mainstay Mohammad Yousuf considers West Indian legend Vivian Richards to be one of the greatest batsmen of all time, but his own idol has always been Javed Miandad. Indian eves packed a punch to achieve a record medal haul in the fourth edition of the World Women’s Boxing Championship in New Delhi recently. The gold rush even exceeded the expectations of the Indian Amateur Boxing Federation (IABF), which was hoping to get at the most two gold. The infectious enthusiasm and excitement that pervaded the Talkatora indoor stadium during the week-long boxing fiesta, was the culmination of proper planning and execution of concepts and ideas to make India a force to reckon with in women’s boxing in a short span of just over five years. The four gold, one silver and three bronze annexed by the Indian eves was a remarkable feat as they had laid low some of the best boxers in the world. India competed in all 13 weight categories (46 kg to 86 kg). But for the early exit, rather narrowly, of Preeti Beniwal (54 kg), Ibomocha Devi (60 kg), Jyotsna (86 kg), Kalpana Choudhary (48 kg) and Aswathi Mol (70 kg), who all had to deal with tougher opponents, India’s medal tally would have been greater. Though women’s boxing got official sanction only in 1994, India took another six years to plunge into the sport. The IABF, under the leadership of Abhay Singh Chautala, decided to promote women’s boxing seriously, and the results are all too evident now. With the Sports Authority of India (SAI) giving a great lending hand by picking the trainees and honing their skills at its training centres, the task of the IABF was made easier, as the federation was left to do only the “pick and choose” policy in shortlisting the most promising among them to give them concentrated training and make them world beaters. The potential of women’s boxing in the country was quite evident in the inaugural World Championship in the USA in 2001 when MC Mary Kom returned home with a silver medal. The journey of the little girl from Chuachandpur in Manipur was full of hardships. She went to Imphal to become an athlete, but ended up as a boxer, even though women’s boxing was then at a nascent stage. The silver spurred Mary Kom to go for the gold in the second edition at Turkey. After that, this spindly girl with nerves of steel and the swiftness of a panther captured the gold at the World Boxing Tournament in Norway (2004) and the World Championship in Moscow last year. 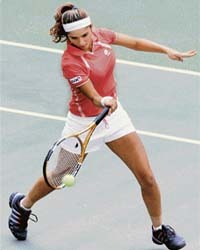 She also won the Asian Championship gold in 2003 (Hisar) and 2005 (Taiwan). Mary Kom was given the Arjuna Award in 2003 and the Padma Shri in 2005. She provided the inspiration for other girls to follow the boxing route with passion and determination, and they don’t regret the decision. The gold medals won by Jenny RL, KC Lekha and Sarita Devi were no flash in the pan, but the result of hard work, determination and latent skills. Mary Kom began her 46 kg title defence by handing out a terrible hiding to Chandrika G of Sri Lanka in the quarterfinal, having got a direct seeding into the last-eight round. She maintained her form in the semifinal against Jong Ok of DPR Korea and the final against former World No. 2 Stelutas Duta of Romania. Mary Kom, who is the world No. 2 in her weight category, was in such devastating form that she made mincemeat of the Romanian girl. Before Mary Kom won her third gold on the trot, another bundle of boxing talent from the North East, Jenny RL of Dinthar Veng (Aizawl), had become the world boxing champion in the 63 kg category. Jenny stopped Klara Svensson of Sweden in the second round, with the referee stepping in to end the “punishment” after the 23-year-old Mizo Police officer had taken a 23-8 lead. Her happiness no bounds when she got the news that she would be promoted to the rank of DSP as an instant reward for her victory. Kerala pugilist Lekha KC (75 kg) fought like a woman possessed to wallop her Chinese rival, Jinzi Li. Imagine, boxing was never her first love. Lekha strayed into the ring after trying her luck in athletics, judo and volleyball. She had even won a silver medal in shot put in the South Zone Sports Festival. But once she made up her mind to pursue boxing with single-minded passion in 2001, there was no looking back. No wonder her idol is women’s world heavyweight champion Laila Ali. Sarita Devi thrashed world No. 3 Viktoria Rudenko of Ukraine 24-10 to annex the 52 kg gold, though Nagisetti Usha disappointed in the 57 kg final as she could not take on the challenge of China’s Yum Kum Ju. The semifinal losses of Chhotu Loura (50 kg) to world No. 3 Hasibe Erokec of Turkey, Aruna Mishra (66 kg) to eventual winner Aya Cissoko of France, and Renu (80 kg) to C Hemingway of the USA ensured bronze medals for the hosts. Over 200 boxers from 29 countries vied for honours in 13 weight categories, and ex-Soviet bloc nations were again expected to sweep the team honours. But India stood in their way with a remarkable display. Chief coach Anoop Singh and his assistant D Chandra Lal observed that India could have added a couple of more gold had not the eves bumped into higher-rated boxers in the earlier rounds. “We had told the girls to go out and get maximum points in the first round itself so that they could fall back and defend those points in the next two rounds, and they did precisely that,” noted Chandra Lal, who is now in line for the Dronacharya Award. Former chief national boxing coach and Dronacharya awardee Om Prakash Bhardwaj said the IABF deserved praise for hosting the World Championship in a flawless manner as the federation raised over Rs 4 crore without taking any immediate financial help from the Union Ministry of Youth Affairs and Sports. “The SAI also deserves a big pat on the back for contributing raw material to the federation for moulding them into world champions (all medal winners are SAI trainees),” said SAI Director VSN Rao. It’s been a dream year for 16-year-old Saina, who was ranked around 100 when it started but has leapfrogged to a career-best world ranking of 27 in women’s singles. Saina shot into the limelight by winning the Philippines Open earlier this year, and she consolidated her growing reputation by reaching the final of the World Junior Championship last month. Nineteen-year-old Sania, on the other hand, has seen her ranking slip about 35 places during the course of a forgettable year. She was a disappointment in all four Grand Slam events. The Hyderabadi girl also came a cropper in singles in the Sunfeast Open in Kolkata, even though she won the doubles crown. However, she did quite well in the inaugural Asian Hopman Cup in Hyderabad last week, guiding India to the title victory. Sania did not drop a single set in her three singles matches during the tournament, easily beating rivals from China, Japan and Chinese Taipei. If she continues in the same vein in the Asian Games, she can win a couple of medals for India (Sania is paired with Rohan Bopanna in mixed doubles). In Doha, her main rivals would be China’s Li Na and Japan’s Aiko Nakamura, both of whom didn’t play in the Hyderabad event. In-form Gaganjeet Bhullar will spearhead the Indian challenge in golf at the Asian Games. Eighteen-year-old Gaganjeet Bhullar of Kapurthala showed his class in the Royal Challenge Samarvir Sahi Amateur Golf Championship at the Chandigarh Golf Club last week. He bridged the four-stroke gap between him and India’s No. 1 amateur player, Anirban Lahiri, on the final day and then upset the Secunderabad player in the playoff. It was a performance which speaks volumes of Gaganjeet’s confidence and determination. The resilient golfer has now set his sights on a medal in the Doha Asian Games (the golf competition will be held from December 8 to 11). Gaganjeet and Anirban are daggers drawn on the greens, but once the 18 holes are over, they hug each other and are the best of friends, telling each other where they faulted. Although India finished fourth in the 2002 Busan Asian Games, Gaganjeet is hopeful of the team winning a medal this year. The Kapurthala teenager has had a very good outing this season. He started with a splendid win at the Eagleton Amateur in Bangalore. He continued his winning spree in the Northern India Amateur, the Jaypee Amateur and the Golden Greens before wrapping up the Royal Challenge golf tour with an exciting win in the Samarvir Sahi Championship. A thorough gentleman off the field, Gaganjeet turns into an aggressive golfer on the greens. Son of ace athlete A.K. Bhullar, who represented India in the 1986 Asian Track and Field Championship, Gaganjeet won the world junior masters crown in Thailand. He was also a member of the Indian team that won the Ravi Kirloskar Trophy at Bangalore last November. As a 16-year-old he created quite an impact in his rookie season on the Royal Challenge Golf Tour by winning three titles to top the 2004-05 Royal Challenge Merit List. Gaganjeet started the 2005-06 season on a poor note because of an injury. But be bounced back brilliantly to finish fourth on the Merit List. This year, Gaganjeet is going great guns. Trailing Anirban by just 14 points before the Chandigarh championship, he caught up with the leading amateur with a brilliant comeback on the last day. Now all eyes will be on Gaganjeet and other members of the Asian Games golf squad (Anirban, Chirag Kumar and Joseph Chakola) when they tee off in Doha. “He has been my inspiration. I have always followed his batting,” Yousuf said when asked to comment on his captain Inzamam-ul-Haq rating him higher as a batsman than Pakistani all-time greats Miandad and Hanif Mohammad. “I am honoured to be given so much praise by Inzamam who himself in my view is one of the best batsman we have ever produced. But I think Miandad was the best,” said Yousuf, who has played 73 Tests. On the first day of the third cricket Test against the West Indies at Karachi, Yousuf stroked his way to his eighth hundred of the calendar year, breaking the record of seven centuries held by Richards and Sri Lanka’s Aravinda de Silva. Yousuf, who last year converted to Islam and is now a devout Muslim, said he was happy to be compared with Richards but he was just satisfied to be scoring runs for his team. Yousuf rated the double hundred he scored against England at Lord’s as the most valuable of his eight centuries in the year. 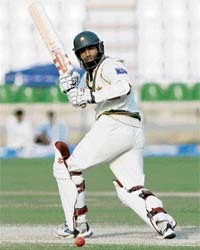 In his last five Tests, Yousuf has got hundreds and he has scored six tons in his eight Tests against the West Indies. He became the third player in Test cricket to have registered five hundreds in successive Tests, joining Australia’s Sir Donald Bradman’s and South Africa’s Jacques Kallis. IAN Chappell recently commented that when he heard that irate Indian cricket fans were burning his brother Greg’s effigy, he told him he felt fortunate that it was not his own. However, despite all the failures and controversies, Greg Chappell is still in the good books of the Board of Control for Cricket in India (BCCI). While India had tasted success under a foreign coach (John Wright), the equations were starkly different then. Wright was a mild-mannered individual who generally shunned the glare of the media and allowed the then captain Sourav Ganguly to call the shots. The arrangement worked splendidly as Ganguly’s flamboyance and assertiveness gave an aggressive look to the team that was riding the crest of a wave at the time. The scenario is entirely different now. While Rahul Dravid has led from the front with his resilient batting, he has not been assertive in his captaincy, letting Greg Chappell dictate terms and take major decisions. Ace golfer Jeev Milkha Singh has done Chandigarh and the country proud by winning three titles this year. The Chandigarh Administration should honour him on Republic Day and also recommend his name for the Padma Shri to the Central Government.